It was an electoral massacre. By the evening of March 8, preliminary results of a special mail-in election for a tax and the formation of the Paso Robles Basin Water District showed overwhelming defeat, with “no” votes hitting more than 70 percent. Even to Tommy Gong, San Luis Obispo County’s impartial clerk-recorder, the results were a bit of a surprise. “I don’t think anyone expected the result the way it turned out,” Gong said. It took years of planning; more than $1 million in taxpayer dollars and campaign funds; and a long road winding to Sacramento, the SLO County Board of Supervisors, and the Local Agency Formation Commission. Now the water district is dead, and people are pondering and pontificating about what’s next. 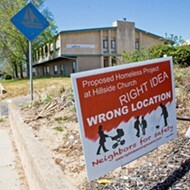 Politics plagued and polarized the proposal from the start. 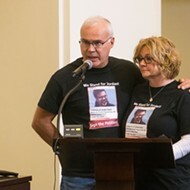 It attracted heated opposition from groups against new regulations and taxes—like the Paso Robles Water Integrity Network (PR-WIN) and the SLO County Cattlemen’s Association—and groups concerned that the district would unfairly represent and benefit large land owners, including North County Watch, and the Santa Lucia Chapter of the Sierra Club. Supporters included the viticulturalist group Paso Robles Agricultural Alliance for Groundwater Solutions (PRAAGS), the rural residential group PRO Water Equity, and Citizens Advocating for Local Management, and the SLO County Farm Bureau, which all said the district was the best route for maintaining local control. The idea came up during a crisis. A major political battle erupted in 2013 after dozens of rural residential wells went dry. All around them, vineyards were being planted and new wills drilled. It angered people, and their voices were loud. 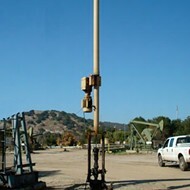 Supervisors narrowly passed an urgency ordinance banning new wells unless certain requirements were met. 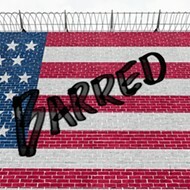 The ordinance became permanent. During that time, PRAAGS proposed the formation of a California water district to facilitate the funding and construction of supplemental water to replenish the basin. To form that district, voters would get one vote per acre, giving large landowners the ability to sway the outcome. GRASSROOTS EFFORT: Cody Ferguson and Greg Grewal were vocally opposed to the water district, which voters rejected in March. The residential group PRO Water Equity said this wasn’t fair, and lobbied for one vote per person. In December 2013, with the help of Supervisor Frank Mecham (his district partly overlies the basin), the groups devised a hybrid district with a nine-member board, including three seats elected by registered voters and two seats each for small, medium, and large landowners. The district required legislation in Sacramento, so Assemblymember Katcho Achadjian sponsored Assembly Bill 2453. Meanwhile, California lawmakers passed the Sustainable Groundwater Management Act (SGMA), requiring management of high priority basins in severe overdraft, including the Paso basin. A Groundwater Sustainability Agency (GSA) must be formed for those basins by June 30, 2017, and a Groundwater Sustainability Plan must be created by 2020 to chart a course for the basin to be balanced by 20 years later. If requirements aren’t met, the state may intervene, bringing what many consider a like-it-or-not management method (the details on when and how that would happen are still fiercely debated). For supporters, the proposed district was considered to be the best anchor for a GSA, which would also include the county and other agencies and cities over the basin. Those supporters, including a couple of supervisors, say that the Board of Supervisors dropped the ball too many times and that local control—where basin overliers represent themselves—was optimal. They said it was either that or eventual state intervention. Cody Ferguson of PR-WIN, which campaigned against the district, disagrees and said the county should be the GSA. He said that it’d be cheaper for the county to do so. Opponents said the district would have favored larger landowners and pumpers, helping them gain control of the groundwater. They said it was a costly and unnecessary body to do a job that the supervisors, sitting at the head of the county’s Flood Control and Water Conservation District, already do. Even if that’s the case, new funds are still needed for a GSA, and it isn’t clear where they’ll come from or who will pay. Those details might come to the fore as supervisors Debbie Arnold (who also has an overlying district) and Lynn Compton prepare an effort for the county to take the lead. That’s made a lot of people nervous, because Arnold and Compton vociferously opposed the countywide water conservation ordinance, a measure designed to slow increasing water demand. That’s one reason Supervisor Mecham is reluctant to keep control in the county. At the board’s March 15 meeting, supervisors Bruce Gibson and Adam Hill suggested it was time the county began talks with the state to consider the options. Mecham said he was interested but is still looking to learn more before charting a course. Paso voters faced three choices on their mail-in ballots: Measures A and B, and candidates running for the board, should one be created. Measure A would have created funding for district management, whether or not the district itself was created. It needed a two-thirds majority for approval; 77.3 percent of voters said no. Measure B, which would have created a water district, saw 73 percent of voters say no. 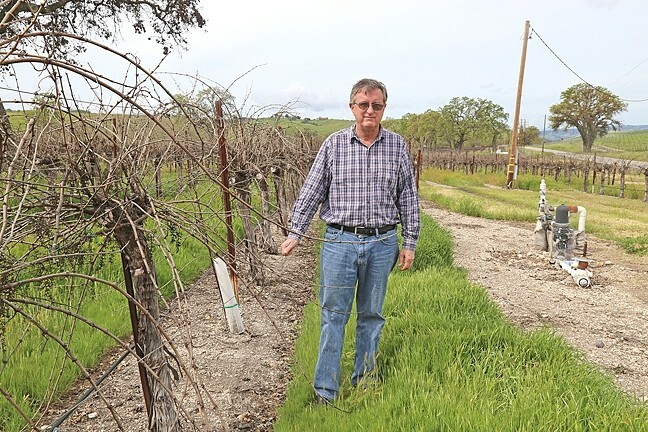 PLUCKED: Dana Merrill, an early proponent of the water district, stands next to his vineyard east of Templeton. Voter turnout was high, showing 64 and 65 percent of voters, respectively. It’s abundantly clear: Voters above the basin don’t want a water district, nor do they want to pay more taxes. Many say an ideological aversion to taxes and government was a large factor. More than half of voters are registered Republicans, 21 percent Democrats, and 19 percent are non-partisan or have no party preference. That the annual cost for many people would be less than $100 didn’t matter. Each parcel would have been assessed a $15 flat fee, with additional fees of $20 per single-family residence, $40 per multi-family residence, and $10 per vacant parcel. Non-irrigated properties were 25 cents per acre, while irrigated parcels were $18 an acre. By design, most of the expenses would have been borne by irrigated agriculture, the basin’s biggest water user, paying an estimated 89 percent of the total $950,689 annual operating cost. The vote still has Dana Merrill, vice chair of PRAAGS and owner of Mesa Vineyard Management and Pomar Junction Vineyard and Winery, scratching his head. Luft, of PRO Water Equity, also sees the missed opportunity. “I don’t want to sound like sour grapes, so to speak, but if we were to have won I would have gladly accepted it,” he said. But for many rural residents, it wasn’t that simple. Cindy Stevens, a Geneseo area resident profiled by New Times in 2013 after she had to drill a new well, wouldn’t say how she voted but said deciding how to vote was tough. She said that a lot of voters had concerns with either option. Stevens said it wasn’t the dollar amount but the concept of another tax that caused unsettling feelings. Many residents harbored resentment toward the wine industry and were uncomfortable funding a district backed by the people often blamed for causing the problem. PR-WIN’s Greg Grewal said there’s a fundamental issue there. “Where was the incentive for me to be a part of something that I don’t benefit from?” Grewal said. During public meetings, Grewal often got fiery and didn’t shy away from calling out people or double standards. But when he and fellow PR-WIN member Ferguson were interviewed in a booth at the Loading Chute in Creston, he calmly discussed the topic. He pointed out that landowners already have to pay for their own wells and all the other components of personal water delivery, and now they’re being asked to fund a management district that would service those who’ve used the resource irresponsibly. UNCONVINCED: Sue Harvey explains her concerns with the proposed water district. That was a concept many voters had trouble with, overshadowing the fact that no matter what they think, more taxes may be inevitable. 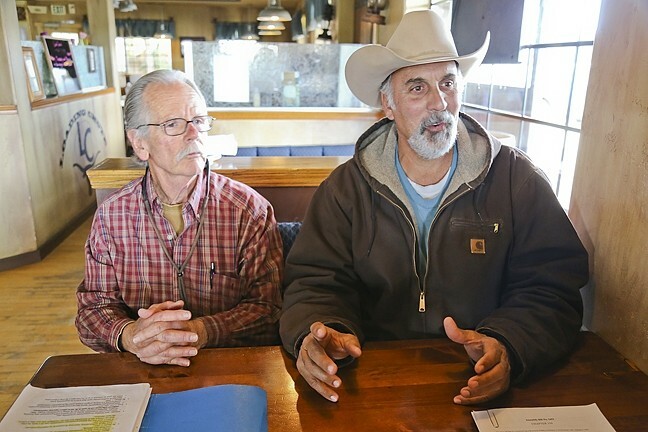 Steve Crouch, a Jardin area resident who manages a dry-farmed vineyard on the west side, said he watched ideology overcome factual analysis, describing it as a “nobody is going to tell me what to do with my water” kind of attitude. “So we all suffer,” he said. Sue Harvey, president of the land-use watchdog North County Watch, disagrees, saying that the lopsided results show it was more than ideology or one key issue. “If it had just been an ideological thing, and it was Republicans versus whatever or environmentalists versus whatever, it wouldn’t have had that kind of result,” said Harvey, who opposed the district. Still, for Crouch, there were reasons to support it. Another factor that swayed many to the no side—the fear that powerful outside interests wanted to move, store, and privatize water. 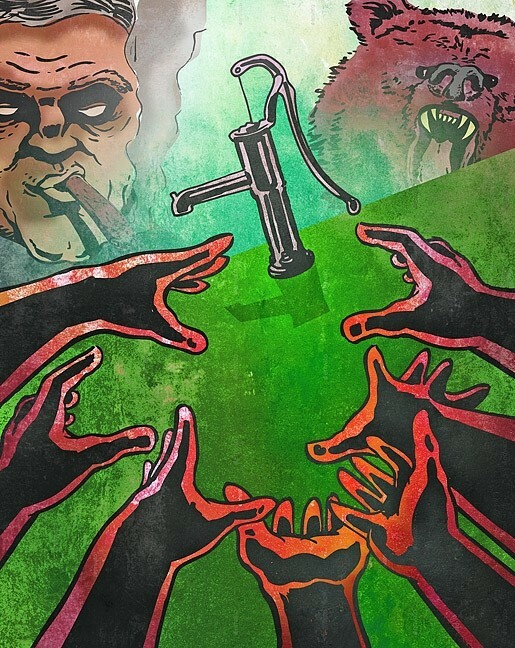 Not long after the water district was first pitched by PRAAGS, people began drawing connections between the group and the arrival of new companies that are supposedly in the water-selling business. For those loathing this plot, there was one specific acquisition that heightened fears. In 2010, Justin Winery & Vineyard was bought by Beverly Hills billionaire Stewart Resnick, owner of the agricultural empire The Wonderful Company (formerly known as Roll Global). The company owns Fiji Water, POM Wonderful pomegranate juice, the cut flower brand Telaflora, and the ever-expanding Paramount Farms, the world’s largest almond, pistachio, and pomegranate producer and a major citrus producer. Resnick has serious influence in California water politics and has a reputation for using heavy legal muscle when it comes to water policy and accumulation. When he purchased Justin, people got nervous. Stories about his various involvements circulate like folktales, along the way being exaggerated or changed. In 2013, the company bought the 742-acre Hardham Ranch in the El Pomar area east of Templeton. Residents said their wells declined after new wells began pumping there. The company became the poster child for all that was and could go wrong. Eventually people started connecting the dots and identified several big players that raised suspicions. Another suspect is Brodiaea Inc., a subsidiary of Harvard University’s in-house investment management firm Harvard Management Company, which purchased existing vineyards and planted several parcels near Shandon, Highway 46 and Geneseo Road, and Cuyama. The Shandon properties, where several deep wells were sunk, are very close to the state water pipeline, raising suspicions of a plan to connect the groundwater to the pipeline. There are others, too, including the agribusiness and real estate company Limoneira—known for their citrus and avocados, and for having connections to the water wheeling company Candiz Inc.—which purchased Windfall Farms, the once-lush Creston Valley horse ranch formerly owned by Jeopardy host Alex Trebek. “The business plan is clearly to plant grapes, create an agricultural history, and then fallow it,” Ferguson with PR-WIN said. 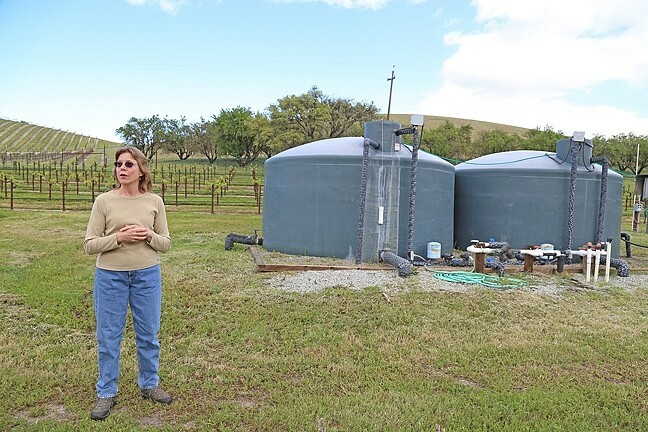 TANKED: Sue Luft stands beside her water tank while talking about why a water district was the best choice to manage the Paso basin. 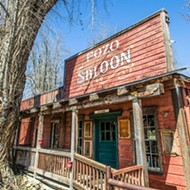 Once it’s fallowed and a water use history has been established, he said, it could be sold off to the highest bidder. Many members of the wine industry downplay these concerns however, and say that buying and running vineyards is just a good investment, not part of a ploy to deal in water. Representatives for Justin and Brodiaea both say they supported the district because they want to be part of the solution to stabilize the basin. Matt Turrentine, of Grapevine Capital Partners, the local agent for Brodiaea, had a similar response. Still, Turrentine and Resnick are constantly attacked, as is anyone connected to them. That includes Luft, who operated an environmental engineering firm in Bakersfield with her husband before retiring to this area. Years ago, they held a consulting contract with the Kern Water Bank, which Resnick controls. Now she’s constantly accused of being involved in the plot as a “former employee” of Resnick. She’s never met the man. Ferguson thinks there’s a conspiracy at work, but doesn’t think it’s a theory. He’s unapologetic that fears of a sinister bigger picture played a large role in defeating the water district, which he saw as necessary to stymie any such scheme. Harvey also sees the looming threat. “From a precautionary perspective, I’d rather fight against it then let it happen,” she said. 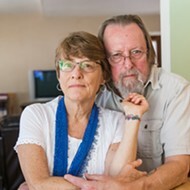 Merrill, whose vineyard management company has done work for both Resnick and Turrintine, suggested these claims were just methods of playing on people’s fear. And he said it worked. “I got to give it to them for pulling it off,” Merrill said. Regardless of why the election went the way it did, it’s over now, and people like Luft are concerned about the future. “A whole lot of us put our lives into this. And now what?” she asked. 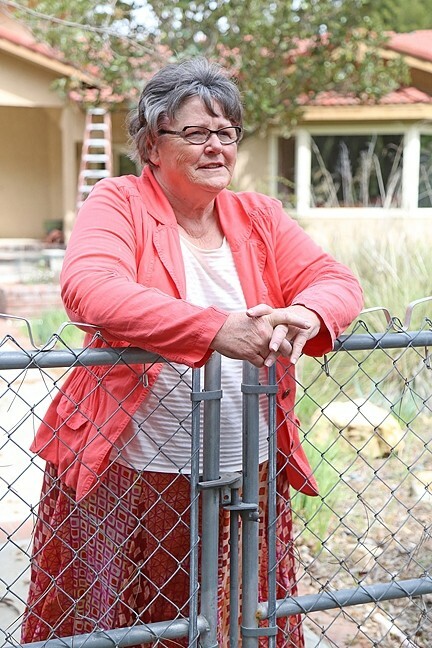 The rocky geology underlying her property makes aquifer recharge a very slow process, and people in similar situations to hers have been hit particularly hard by the groundwater basin’s plight. She’s already seen one well go dry and has taken several measures to treat water from her new well because it’s pulling up ancient geothermal water with a high concentration of salts. That water may eventually kill her small, mostly dry-farmed 2-acre vineyard. It’s an ominous sign of where things may be going, with or without a water district. The view from her property shows young vineyards crawling up and over several hillsides into the horizon. Down the road, a sign posted on a fence reads “No Water District.” Up the road, a “for sale” sign went up the day after the election.